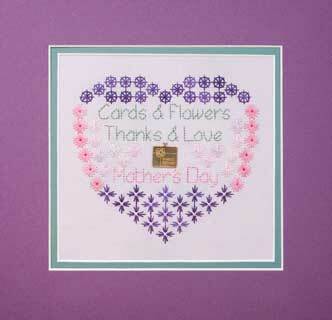 Doesn't Mom deserve hearts, flowers and cards for Mother's Day? 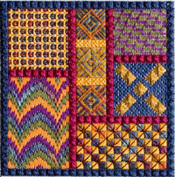 Stitch her one with this beautiful sampler on 28 ct. hand-dyed Lavender Sunset Jobelan. The stitches are worked with Crescent Colours Pansy Purple, Cerise and Sugar and Spice, with DMC floss, and include daisy stitch, Rhodes octagon, tied double cross, tied windmill and backstitch. Finished design is 5" x 4 ½", 76 x 69 stitches. The charm says "Dearest Mother", and is included with the chart or kit. Finished size 5" x 4 ½"